Continuing our discontinuous series of “blog tour” posts featuring fellow members of the Codex Writers online community. Today we conclude our interview with Bradley Beaulieu, author of The Winds of Khalakovo. Read yesterday’s interview here. 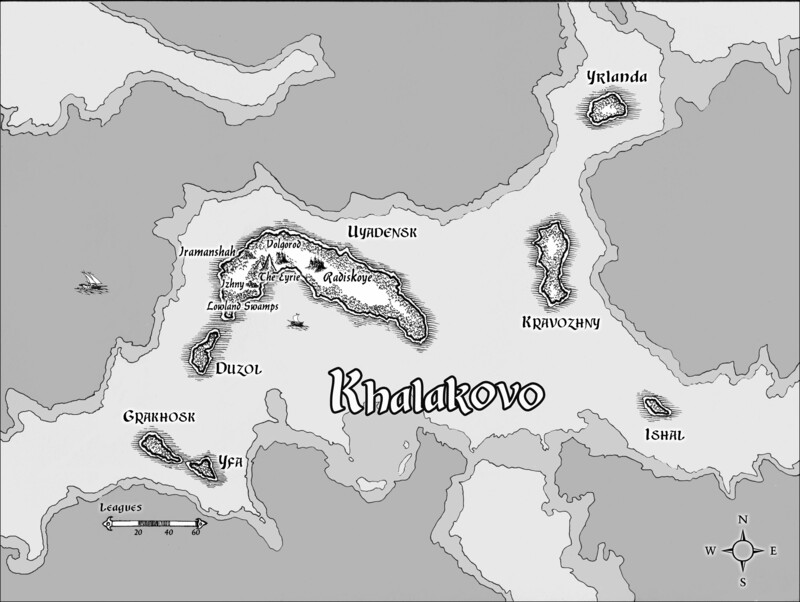 What was the biggest surprise you got out of working on The Winds of Khalakovo? Is there anything in particular you hope your readers get out of it? I suppose the biggest surprise is just how much of our world made it into the book. I was getting into politics just when I was getting into the thick of this book, and some of it crept in. The struggles in the Middle East certainly show up. And that was a surprise in a way. But on the other hand, how can it not? The events of our time affect me — they affect us all — so in some ways I imagine it’s impossible to keep those things out (assuming you’re writing a sweeping story with a lot of political implications). I tried to be very careful not to pass judgment in the book, however. I don’t want my writing to be didactic. If it happens to illuminate some condition in our world and starts a discussion, I’m fine with that, but the story and the world come first. They are their own. They are not of our world, so I wanted them to be insular from it. By the same token (I know this sounds like I’m backtracking, but I’m really not!) if some of the issues we’re facing today came up in the story naturally, I didn’t try to quash them. I let them be and allowed them to play out as the world and politics and characters dictated. It’s a fine line, I think. One of my favorite writers is Tim Powers, and I’ve heard him say at a few conventions that he never tries to say anything in his writing. He gets laughs with that line, and I know it’s impossible to take that sentiment literally, but I feel exactly like he does. I’m not trying to say anything with my novels. But just as certainly as I’m not consciously trying, those things that are important to me or that I’m trying to explore will naturally come up in the writing whether I want them to or not. So this was probably the biggest surprise: the exploration of this saying nothing while saying things. It was a fun thought experiment to consider it more fully as I was writing and also while editing, just what the book was about and whether or not I had let my views come too front-and-center. As for what I hope readers take from the novel, I would say this: that many of our conflicts — be they personal or political — come from a simple lack of understanding and an allowance of credibility to those who speak the loudest. I think it’s important to try, as much as we’re able, to see the other side of a conflict. Perhaps if we do, we might find that unscalable differences are not so difficult to climb after all. Though again, I wasn’t trying to say these things; I simply think that this is one of the themes that played throughout the novel. What’s next for you … and what did you learn from The Winds of Khalakovo that you’re applying to it? Well, I’m contracted for two more books. I’m in the final stages (thank goodness) of the first draft of Book 2, The Straits of Galahesh. Book 3 is bubbling around in my hindbrain now, but it’s starting to become more clear. I’m really looking forward to finishing these books, not because they wear on me (they don’t), but because I’m anxious to simply have the arc completed. Much as Tolkien considered The Lord of the Rings one book (and it was), I consider The Lays of Anuskaya one book, one story. It’ll be nice to have that wrapped up and out in the world. Beyond this, I have a science-fantasy in mind, tentatively titled The Days of Dust and Ash. Think Nausicaä of the Valley of the Wind meets The Coldfire Trilogy. I’m really excited about this story, because it’s a departure from what I’ve written in the past, though it will still be fantastic and wide in scope. The story focuses on a young girl who is summoned from the dust, a global consciousness that was created as the last great age of technology fell under a nanite plague. One thing I’m certainly bringing to this next project is the notion of using artwork to advise the story. I’ve already collected a dozen or so sci-fi, ghostly images that have helped me to refine the “technology” of the dust — white magic, if you will — and ash — black magic. I’ll also use the fractal mapper again. The story will take place on a water-poor world, and mostly in salt flats, in particular. The ash — the force of evil — has trouble closing in on the pockets of the world that are covered in salt. But as the story opens, the ash is slowly exerting itself, turning back the tide against the small pockets of humanity, creating a pressure cooker for those that have somehow managed to remain alive through the global catastrophe. The Winds of Khalakovo is due out in April 2011 from Night Shade Books. Learn more about Bradley and The Winds of Khalakovo on his web site, http://quillings.com/. Tagged codex, fantasy. Bookmark the permalink.